Few weeks ago I released a new plugin for Moovida. 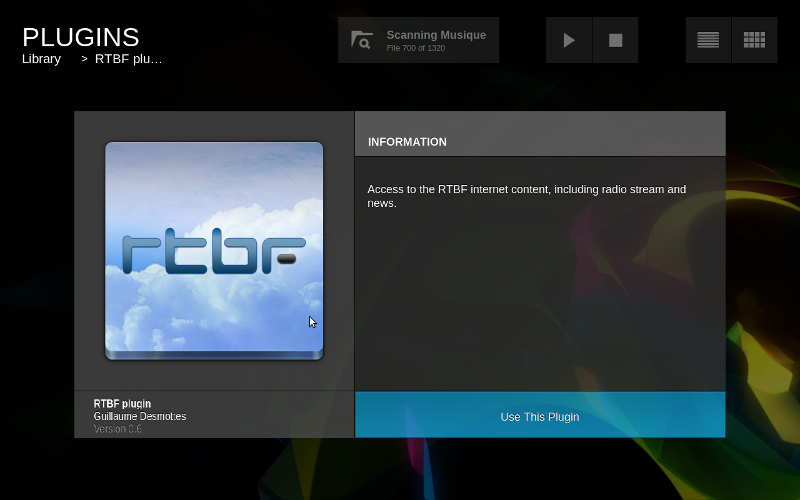 This little brother of my RTBF plugin brings content from the ARTE+7 website to Moovida. ARTE is a cultural Franco-German public TV network providing lot of very interesting documentaries. Unfortunately, because of legal reasons, most of the documentaries are only available from Germany, France and Belgium. That's a shame because the content is generally pretty good. So if you are lucky enough to live in one of those countries you should really install Moovida and give the plugin a try (it should be installed by default now). Three weeks ago Fluendo and Mandriva organized a plugin developement contest. The contest ended last week and I won! To celebrate that I wrote a small text introducing myself and my FOSS contributions on the Moovida blog. I just released the 0.6 version of my Elisa/Moovida RTBF plugin. The goal of this release is to integrate better with Moovida's user interface. - Fix "Use this plugin" hook with Moovida. - Use new, Moovida style, square icon. - Move radios menu to "Internet -> Radio"
It should hopefully be available through Moovida's plugin section next week.